An unfortunate town in Australia’s Northern Territory, Borroloola, finds itself stalked. For whatever reason, the town is saltwater crocodile central, as the town has been plagued by not one, but three different giant crocodiles that have been eating livestock and generally terrorizing the citizens of the small town outside Darwin (where the crocs take water aerobics). Two of them have been captured or killed, but the third is still on the loose. The crocodile in the above photo is a staggering 6.5 meters (over 21 feet) long. 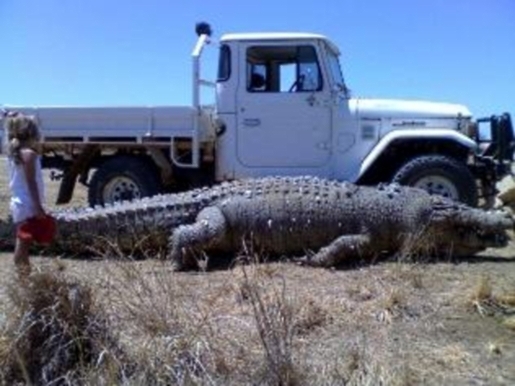 Someone better call Crocodile Dundee in to deal with this thing, because otherwise things might get out of hand!